After spending the day running errands together, Suri & Katie were spotted entering the Gerald Schoenfeld Theatre on Monday, 29. Suri is wearing her favorite White Scallop Placket Coat by Best & Co, which she first wore on December 9th. 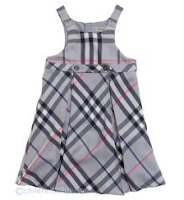 Grey Tartan Check Pinafore Dress by Burberry. Suri & Katie spotted leaving their New York City apartment on Monday, 29. Suri & Katie were spotted leaving their their New York City apartment on Saturday, 27. 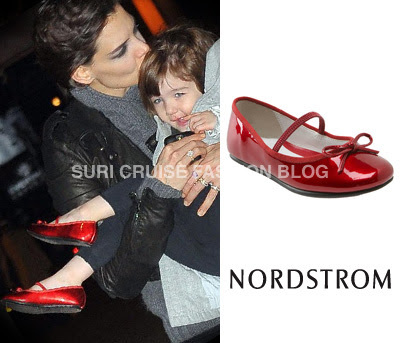 Suri is wearing Custom Made Red Patent Ballerina Shoes by Roger Vivier, which she first wore on October 7th. Suri & Katie were spotted out to see “Bolt” at a New York City movie theater on Saturday evening, 27. Suri is wearing a pretty dress designed by Katie (my guess! ), which she first wore on August 6th. 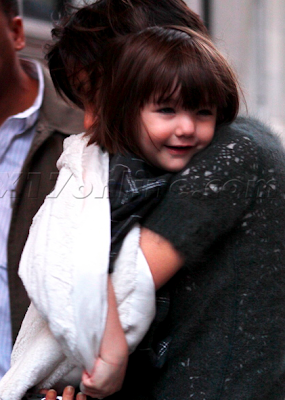 Suri & Katie were spotted outside their Soho apartment on Friday, 26. 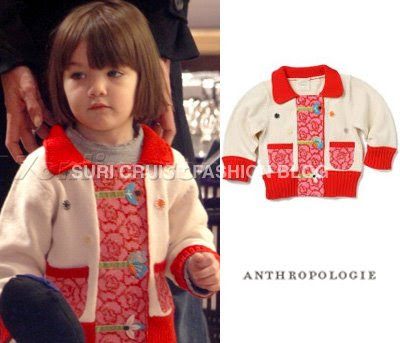 Suri is wearing Bashful Elephant Sweater by Anthropologie Kids. "We've spent a lot of time soaking up celebrity baby cuteness, but will always have a special place in our hearts for Suri Cruise. From her impressive toy collection to her impeccable fashion sense, we've had a blast watching this toddler take her parents around NYC this year. 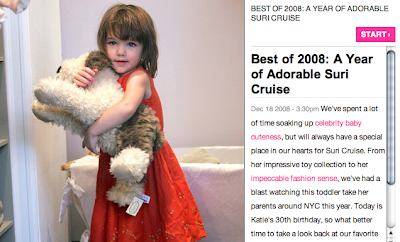 Take a look back at our favorite Suri moments of 2008. 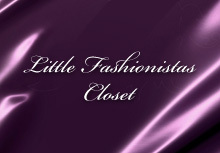 Don't forget to check out all of our Best of 2008 Coverage." by PopSugar. Suri & Katie fall into The GAP to do some last-minute Christmas shopping on the eve of Christmas Eve on Tuesday, 23. Upon leaving, Suri was seen applying some cherry chapstick onto her lips. Suri & Katie were spotted arriving back at their NYC apartment later on Tuesday, 23. 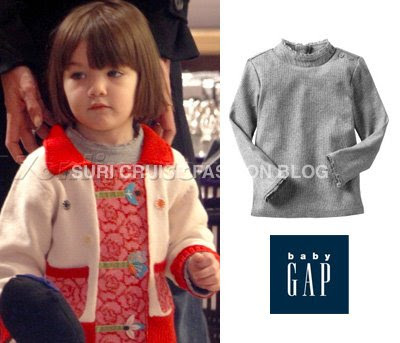 Suri is wearing Lace Trim Turtleneck by baby GAP. Suri & Katie pictured on the way back into their New York City apartment after doing a little shopping in Columbus Circle on Sunday, 21. The mother-daughter duo was seen clothes shopping at the J.Crew store at the Time Warner Center and than heading over to Borders to peruse their selection of books. They also dined at the Japanese restaurant Nobu after Katie's Sunday night performance of the Arthur Miller play All My Sons. Suri was seen carrying around a pack of gum — Trident White Cool Colada! 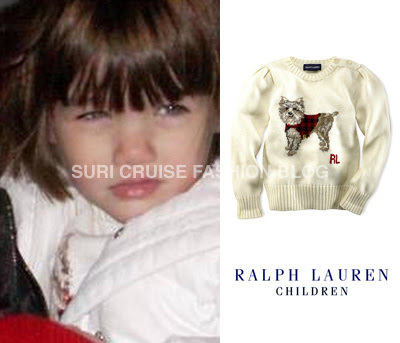 Suri is wearing Cotton Pup Crewneck Sweater by Ralph Lauren Children, which she first wore on December 6th. 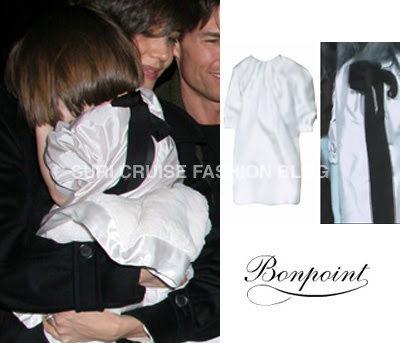 Suri wore this White Puff Sleeves Dress with Black Bow (available in-store only ) by Bonpoint on November 26th. Suri was spotted leaving the apartment with a bodyguard for a trip to the park on Thursday, 18. Suri & Katie had a midday meet-up for a break from the action. Katie brought Suri for her birthday night performance to the Gerald Schoenfeld Theater on Thursday night. 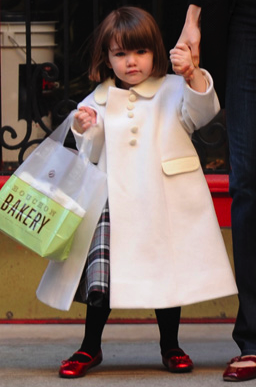 Suri is wearing White Scallop Placket Coat by Best & Co, which she first wore on December 9th. Cruise Family were spotted on their way home from Katie’s “All My Sons” performance on Wednesday, 17. Suri & Katie quickly made their way from the car to the theater entrance as Katie readied for another performance of “All My Sons” on Wednesday, 17. 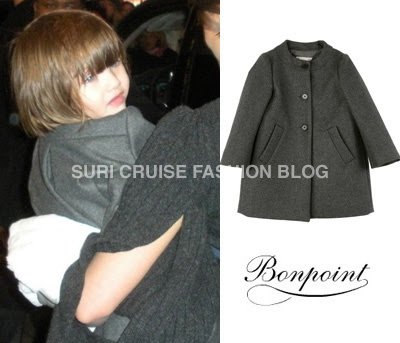 Suri is wearing BALENCIA Boiled Wool Cloth Coat by Bonpoint. Suri & Katie stepping out for a stroll in New York City in Tuesday, 16.
and later in the evening Cruise Family was spotted out for dinner at PJ Clarke’s on Manhattan’s Upper West Side. 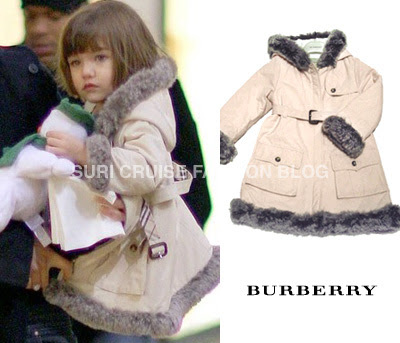 and Fur Trimmed Parka by Burberry, which she first wore on November 20th. Enjoying all of the holiday-flavored benefits of living in New York City, Suri & Katie headed over to the NYC Ballet to enjoy an enchanted evening at a performance of “The Nutcracker” on December, 14.
her outfit is completed by Bella Ballet Flat in Candy Red by Nordstrom, which she firt wore on November 20th. 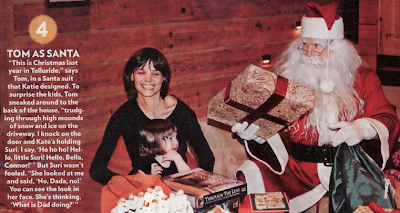 Never seen before inside picture from Cruise Family Xmas party last year in Telluride - December 2007. This picture is from the People's magazine. Credit for the scan goes to myma & Vania. Suri accompanied Katie for her matinee show in the Gerald Schoenfeld Theatre for “All My Sons” in New York City on Sunday, 14. Joining in on the fun, Katie’s parents, Kathleen and Martin, followed along as they walked in the stage entrance. 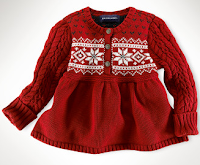 Red Snowflake Sweater by Ralph Lauren. Bootcut Jeans by baby GAP. Suri plays a little bit of peek-a-boo as Katie takes her home after another performance of All My Sons in New York City on Saturday, 13. Suri wore this Red Duchess Dress by Ralph Lauren Children on November 28th. Suri wore this Cotton Pup Crewneck Sweater by Ralph Lauren Children on December 6th. Suri is heading out into the rain with Katie after shopping at housewares store Williams-Sonoma in New York City on Thursday, 11. 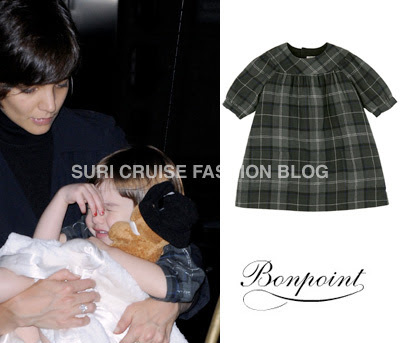 Suri is wearing BROOKE Velvet Dres by Bonpoint. Suri accompanied her mother to the Gerald Schoenfeld Theater, where Katie once again performed her Broadway play, All My Sons; on Wednesday, 10. 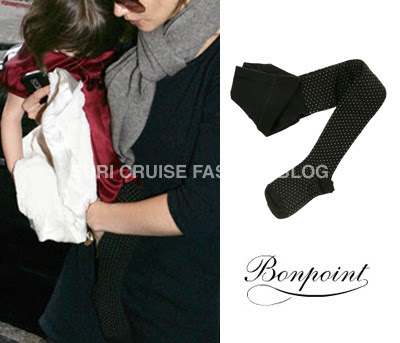 Suir is wearing PLUMETI Black Tights by Bonpoint. 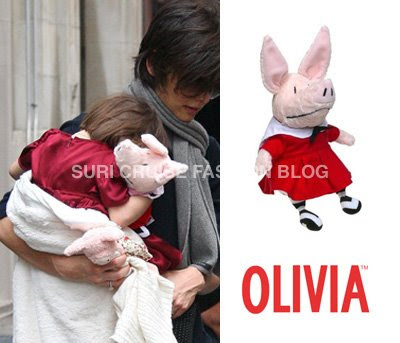 Suri carried around her very cute stuffed animal, Olivia The Pig (a fictional pig featured in children’s books). 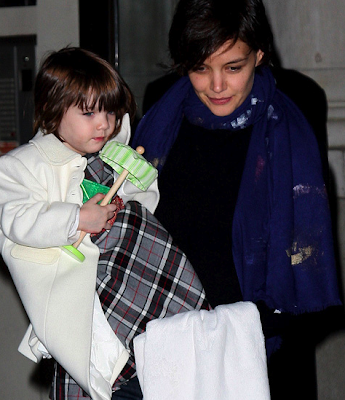 Suri & Katie spotted venturing out into a chilly New York City on Tuesday, 9. The mother-daughter duo, who wore matching silver shoes, headed to a party together. 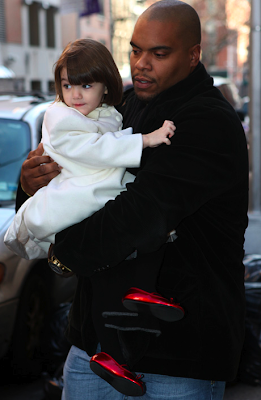 Katie was seen carrying a greeting card and a gift in one hand and holding hands with Suri in the other. Suir is wearing White Scallop Placket Coat by Best & Co. Thanks to Nicole from Sharp Communications, Inc. for the coat info. Suri is wearing Hand-Smocked Plaid Silk Dress form Luxe Celebration line by Janie & Jack. Thanks to Mandee & Vanessa for the hint.